First I collected some 2x4s we had leftover from previous projects. Then I marked them to cut. I ripped most of the boards in half in order to make the house as light as possible. 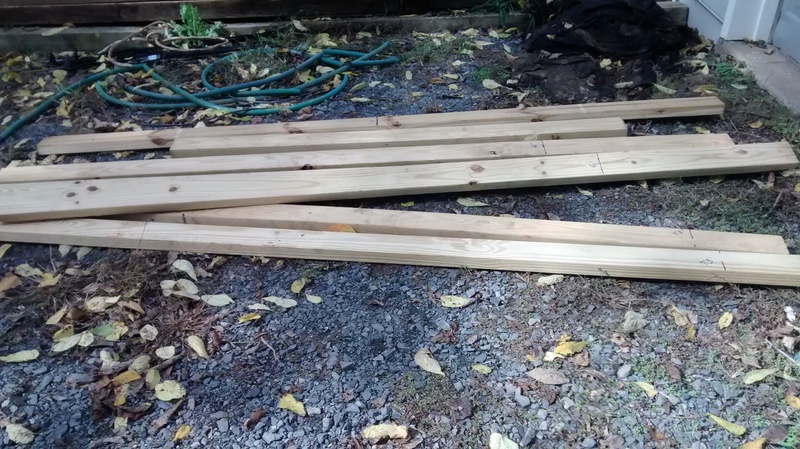 As far as lengths,boards were cut to 4ft or 6ft, and the boards for the roof/hypotenuse of the triangle were 7.2ft. For the boards going along the roof, I cut one edge at an angle so the boards would be flush with the boards on the base. You can see these angles in the above picture on the two boards at the far right. 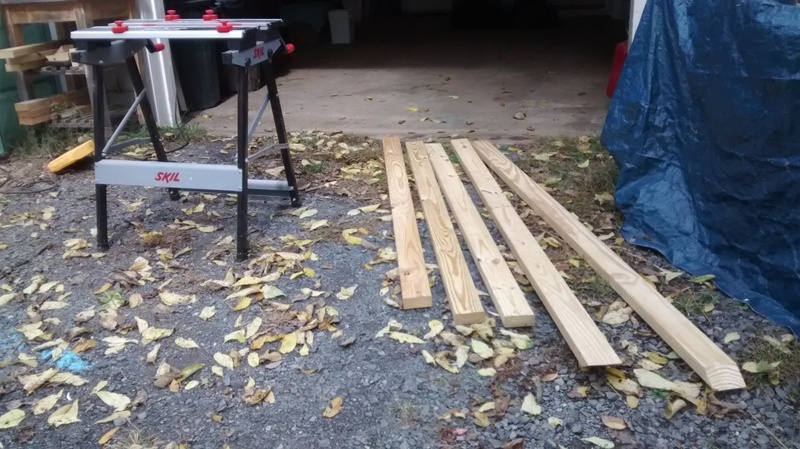 To figure out the angle to cut the boards, I used trigonometry. 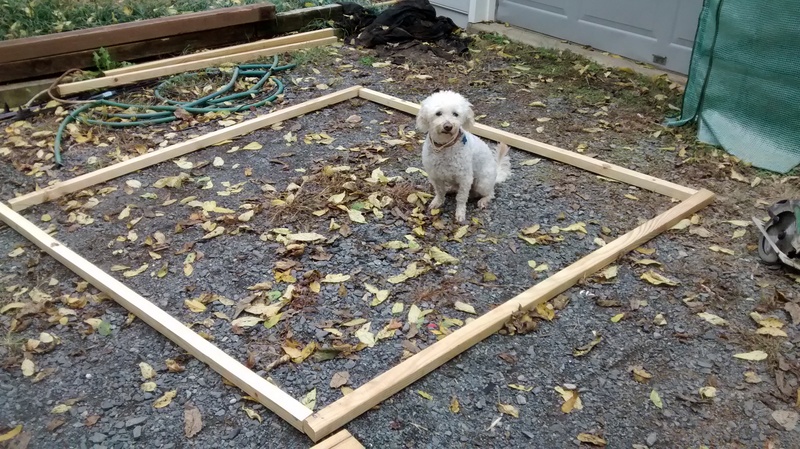 After ripping most of the 2x4s, I assembled the 6ftx6ft base. Noah Dog poses to give you scale. Next I attached the vertical supports, which were the only boards NOT ripped. Since they’d support the roof, I thought they should be as sturdy as possible. Then I connected the top of the vertical supports with a horizontal board. That gave me a place to attach the diagonal roof beams. In the shot above of the frame, the dimensions can be easily seen: the foundation of the house is 6ftx6ft, and the front opening side is 6ft long by 4ft high. Once the frame was built, it was time to work on the roof. We decided to put very thin plywood on the roof, covered with a tarp. Working with the plywood (cutting and attaching it) was the only part of this project that required two people. The roof’s dimensions were 6ft wide by 7.2ft long, which doesn’t match well with the standard plywood dimensions of 4ft by 8ft. That was fine for us, though, since I was using only one standard sheet of plywood, and was piecing the rest with randomly sized scrap pieces of plywood left over from previous projects. 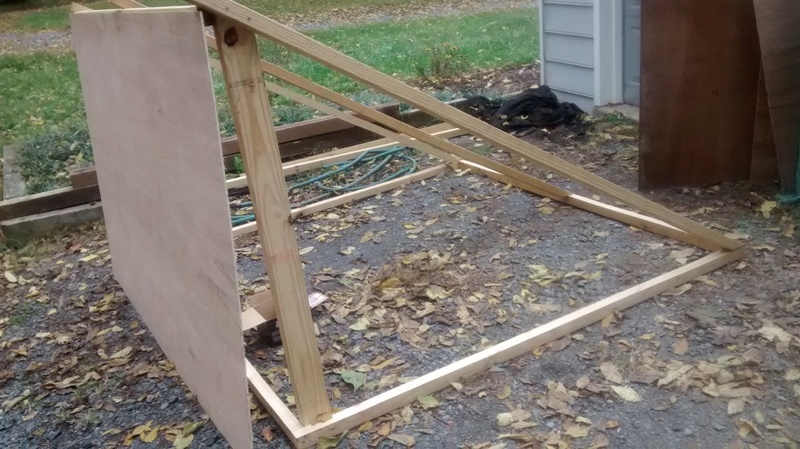 Unfortunately I didn’t get a picture of the plywood assembled on the roof before covering it with a tarp. It started raining when we were finishing with the plywood, so we put the tarp on as quickly as possible to protect the wood. 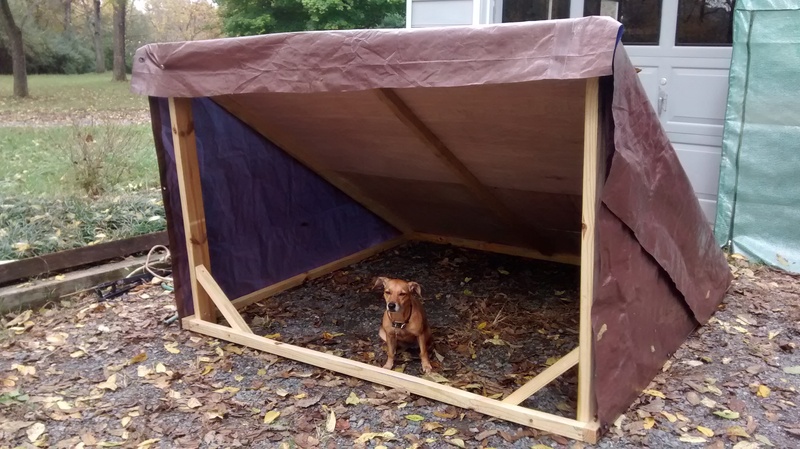 I cut up a tarp for the roof and sides. I had the roof tarp overhang the sides as much as possible given the original starting size of the tarp. To hold the tarp on, I put grommets on the tarp (purchased from Harbor Freight) where they’d line up with the wood frame, hammered a nail into the frame, and slid the grommet onto the nail. (Update: after a couple of weeks, some of the grommets ripped out and some wouldn’t stay on the nails, so we ended up nailing the tarp directly to the wood as needed to secure it). Molly demonstrates the hog house in the above picture. One more addition we made to the frame, visible in the photo above, are diagonal braces for the vertical supports. We felt they where too flimsy at first, but the diagonal braces made the structure sturdy. 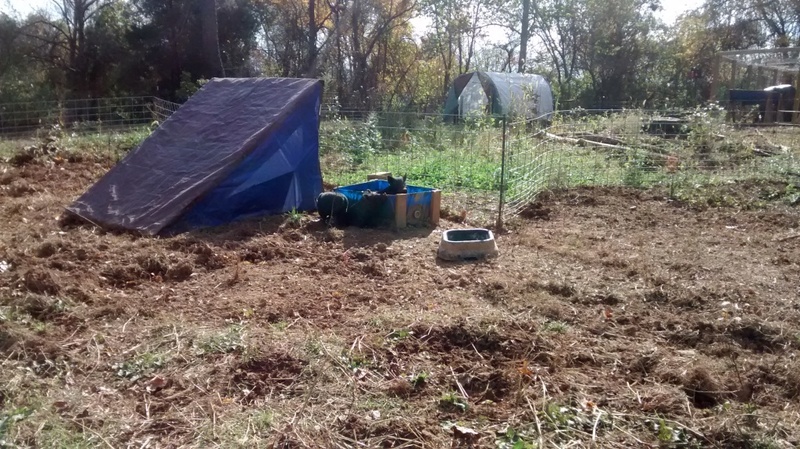 The hog house has been in use for over a month, and overall it has held up very well. We ended up nailing in the tarp more as detailed above, but that’s the only construction update we’ve made. The house is light enough that two people can easily carry it, which is nice since the hogs will have rotational pens. There was a particularly windy day when the hog house was actually picked up by the wind, though. After that we put some cinder blocks over one of the base wood pieces to hold it down, and the house hasn’t moved since! 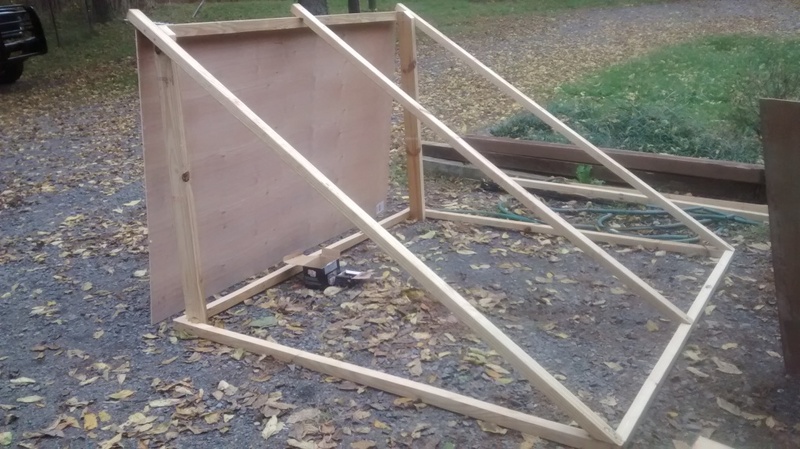 It’s working well, and we plan on making more hog houses with this design as needed in the future.